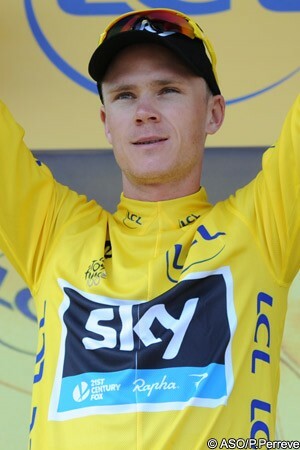 Chris Froome took his third victory in the 2013 Tour de France as he took the stage 17 time trial, between Embrun and Chorges. The British rider, starting last in the Maillot Jaune, completed the mountainous 32km course in a time of 51 minutes 33 seconds, to go nine seconds quicker than big overall rival Alberto Contador (Saxo-Tinkoff). Third place went to Joaquim Rodríguez (Katusha), just one more second behind, as rain in the middle of the stage made much of the course slippery for a number of riders. Froome’s victory saw him narrowly increase his overall lead over Contador to 4’34”, but overnight second place Bauke Mollema (Belkin) lost 2’09” to the British rider and slipped off the provisional podium. A strong ride from Contador’s Saxo-Tinkoff teammate Roman Kreuziger, who finished just 23 seconds behind Froome, saw the Czech rider step up to third overall, 4’51” behind. “I'm really surprised with today's result," said Froome afterwards. "I went in almost prepared to lose a little bit of time just thinking about the days to come and not wanted to absolutely put myself in the hurt-box today ahead of tomorrow's two times up Alpe d'Huez. I didn't hurt myself as much as I did on the first time trial but I was really surprised. I was quite encouraged to hear the time checks and to hear that I wasn't actually too far off Contador on the first check and the second check. “I knew, having changed to the time trial bike for the end – with the bigger gears, I was able to definitely gain a few seconds. “It's going to be a race all the way to Paris," he added. "Even though I've got quite a good buffer of over four minutes, I still feel like that's being challenged every day and especially now as these next three days are going to be the hardest of the Tour so far." The course could not have been more different from the similarly distanced stage 11 time trial, as it featured the two 2nd category climbs of the Côte de Puy-Sanières and Côte de Réallon. This was reflected in the fortunes of Lanterne Rouge Svein Tuft (Orica-GreenEdge), who had finished sixth that day. As he had done in Normandy, Tuft finished first, but his time of 59’34” was quickly beaten by most of the riders that followed. The first decent time was set by Netherlands time trial champion Lieuwe Westra (Vacansoleil-DCM), who completed the course in 54’02”, who was to sit at the top of the leader board for some time. Finally Westra was pushed out of the hotseat, however, as Ion Izagirre (Euskaltel-Euskadi) finished. The 24-year-old Basque had been 20 seconds behind the time best of Westra’s teammate Thomas De Gendt at the 13.5km point, but had been a single second ahead of the Belgian at the top of the Côte de Réallon. Although he was not able to descend to the finish as quickly as Westra had done, his 31-second advantage over the Dutchman was to be just enough and he crossed the line in a time of 53’58”, a slim 4 seconds ahead. As the last forty riders were taking the start, it began to rain on parts of the course; the technical descent from the top of the first climb, the Puy-Sanières, quickly became slippery as a fast-starting Arnold Jeannesson (FDJ.fr) was the first rider to have to tiptoe his way down. Tejay van Garderen (BMC Racing) had been 22 seconds slower than the time set by De Gendt at the 13.5km point, but the American was eight seconds ahead of Izagirre at the top of the Côte de Réallon. The Tour of California winner was one of the few riders to get faster in the final kilometres of the course - having switched to a full-on time trial bike - and crossed the line in 53’24” to go 34 seconds faster. With conditions worsening on the Puy-Sanières, van Garderen’s time was already beginning to look like it might be good enough to win. Having lost just over a minute to the fastest time of De Gendt on the first climb, Pierre Rolland (Europcar) was 3’19” behind by the time he reached the bottom, and was in 152nd place. The rain stopped almost as soon as it had started, but the roads were taking some time to dry and there were several small puddles in many places. Andy Schleck (RadioShack-Leopard) was fourth at the first checkpoint, just 18 seconds down, at the top of the first climb, but was 1’03” back at the bottom of the descent in 30th place. Alejandro Valverde (Movistar) then went quickest at the 6.5km checkpoint, 16 seconds quicker than De Gendt, in 15 minutes exactly. With the road apparently now drying considerably, the Spanish rider maintained that gap as he went through Picounes (Savines-le-Lac) in 22’15”. Schleck was back up to seventh at the top of the Côte de Réallon, and was now just 35 seconds behind van Garderen. Valverde flew through the 20km point in 38’48”, however, a massive 59 seconds quicker than the BMC Racing rider. Valverde’s best time at 6.5km fell shortly afterwards though, as compatriot Joaquim Rodríguez (Katusha) went three seconds quicker in 14’57”. Schleck the finished in the provisional third best time, just 36 seconds outside that of van Garderen. In the battle for the white jersey, Michal Kwiatkowski (Omega Pharma-Quick Step) went through 6.5km just 24 seconds behind Rodríguez, while Nairo Quintana (Movistar) had conceded 33. Contador then went through 17 seconds quicker than his compatriot, lowering the best time to 14’40”. Having only been 14th fastest at the 20km point Maxime Monfort (RadioShack-Leopard) flew down the final sector to cross the line in second place, jusdt 26 seconds behind van Garderen. Valverde was not far behind the former Belgian time trial champion, however, and blasted across the line in a new best time of 52’03”, 1’21” quicker than the American. Second place overall Bauke Mollema (Belkin) passed through the first checkpoint 1’07” behind Contador, having lost all the time he had on the Spaniard and more in the first sector. Froome then went through in second place, just two seconds off the pace of his Spanish rival. Andrew Talansky (Garmin-Sharp), having posted solid times all the way around the course, the crossed the line in second place; ahead of compatriot van Garderen, but 1’11” behind Valverde. Contador was then the fastest through the 13.5km point, at the foot of the first descent, in a time of 21’43”. Kwiatkowski then finished just 1’03” behind Valverde in second place, looking like he may take back the white jersey at the end of the stage. Quintana was just 19 seconds behind his Movistar teammate over the top of the second climb, however, and now likely to hang on to it himself. Rodríguez was fastest through the third checkpoint - having switched to his time trial bike partway up the climb - going through in 38’30”, 18 seconds quicker than Valverde. Froome was 20 seconds behind Contador as he passed through the foot of the descent and, shortly afterwards, the Saxo-Tinkoff rider went through the third checkpoint six seconds faster than Rodríguez. The Catalan was flying into the finish, however, and crossed the line in 51’43” to push Valverde down to second. Contador looked sure to take over second place from Mollema, as the Dutchman crossed the Côte de Réallon 1’53” behind Contador. Froome stopped to change bikes before the third checkpoint, and so was 11 seconds behind the Spanish rider as he finally crested the climb. Contador had elected not to change bikes, and it was beginning to rain on the descent. Quintana then finished just 52’44” behind Rodríguez, 1’01” behind the Katusha rider, and 22 ahead of white jersey rival Kwiatkowski. Having crashed and fractured his collarbone on his morning reconnaissance ride, Jean-Christophe Péraud (AG2R La Mondiale) crashed onto the same side on a greasy corner and was unable to continue. Kreuziger, who had been setting markers for Contador all the way around, crossed the line in 51’56, to go into second place. Everybody was pushed down a place as Contador arrived at the finish, however, to take the lead with 51’42”, less than a second quicker than Rodríguez. The rain was falling heavier on Froome as he was coming down the final descent, slowing the British rider on many of the corners. With just over a kilometre to go, on the same corner that had seen Péraud crash, Mollema slid into the barriers and had to stop. The Dutchman managed to stay upright, but had to get started again, and sprinted into the finishing straight. He crossed the line in 53’42”, to take provisional tenth, but lose his place on the podium to both Contador and Kreuziger. Froome was now powering into the finish, and crossed the line in 51’33” to go nine seconds ahead of Contador and take his third stage of the race.